The Organic Cotton Ultra 2 in 1 will grow with your baby and child for many years while providing a more natural, healthy and comfortable sleep environment. The waterproof side is perfect for babies and training toddlers, while the quilted side offers a more luxurious "feel" for older children. 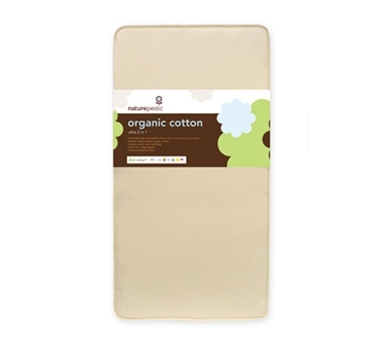 With 252 coils, edge support, organic cotton throughout, and a versatile 2 in 1 design, the Organic Cotton Ultra 2 in 1 is an excellent choice for parents seeking to eliminate potentially harmful chemicals, dust mites and other allergens. It is GOTS certified organic, and was produced in a factory that meets the strictest GREENGUARD® certification standards for eliminating chemical emissions. Wipe clean waterproof surface so pure it meets food contact standards. Perfect for infants and training toddlers. Luxuriously quilted organic cotton fabric for a more plush mattress feel. Please note that this side is not waterproof. Organic Cotton is an ideal material that is both natural and renewable. It is a healthier alternative to chemically treated foams and allergy-prone latex. All mattresses feature Certified organic cotton to provide a healthy, comfortable sleep environment. This fabric has an exquisite finish and a more durable long lasting construction.